RSN is happy to present analysis on the Survey Report from Melissa M. Wilcox and Charles Mathewes. E-mail rsn@aarweb.org if you have thoughts on the data you'd like to share with readers. The bare fact that this survey was produced at all is perhaps the most important thing about it. It suggests a greater degree of seriousness about confronting the many challenges we face as teachers in the liberal arts, and in religious studies more specifically. We should all be grateful for that. But we have to be honest: the second most interesting thing about this survey is how little it tells us, and how much more we might want to know. Begin with a couple sampling problems that the survey seems to face. First, the population studied strikes me as remarkably white, with 89.5% of the participants at least partially identifying as white (and only 2.6% of them (at most) identified another ethnicity or race). Also, 55.8% were female. The latter seems to me more statistically similar with my department’s experience, but the former seems a bit off. Does this skew the findings of the survey? It’s a genuine question. 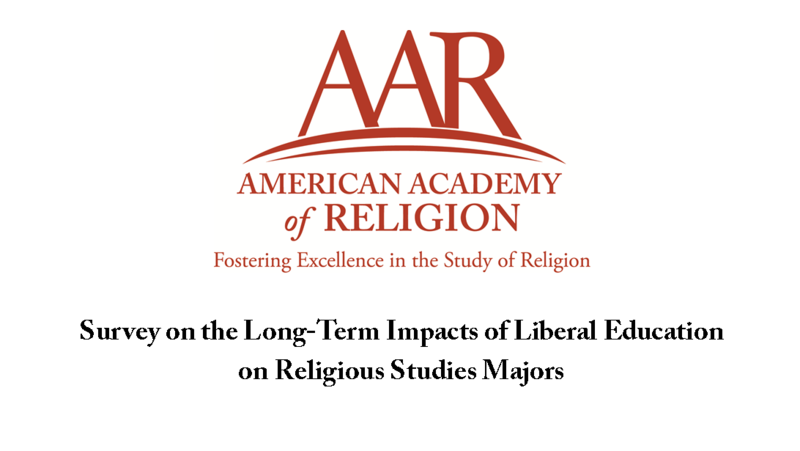 Second, we don’t really have any way to measure these findings against other majors, and so we don’t know how much of this is common to higher education graduates in general, and how much is specific to religious studies majors in particular. There’s nothing to do about this, except to note it, and recognize that this means any judgment we make is very obscure. In the future, it could be useful for the AAR to coordinate with other scholarly associations to produce a larger survey that procures findings for majors across a number of disciplines. That would help us with this problem, at least a bit. Alongside those obstacles, it is also quite difficult to discern what exactly is demonstrated by the questions about how the interviewees think they improved, apart from their own current subjective self-assessment. But what does that tell us about their improvements? It is hard to know what these questions measure apart from interviewees’ current conception of their past, and they are hardly without incentive to tell a certain narrative. A skeptic might suggest that these questions demonstrate simply our ability, as teachers, to convince the students of a narrative. But we don’t need to be very cynical to admit that they do not speak directly to any objective assessment of actual learning. What the results do suggest, at least indirectly, is that students find religious studies more enriching than useful. Of course that is in many ways a deeply contestable distinction, and ultimately even I might well want to contest it; but for starters, the two registers seem at least dimly distinguishable in the way that they manifest themselves in their answers to questions. They affirm that their major makes a positive contribution to their lives, and, with somewhat less confidence, affirm that the skills they developed in their major, considered as relatively free-standing, have made a contribution to their lives. But as we will see, when it comes to their careers, the major’s applicability is less clear. There is something interesting revealed in the self-assessment of particular facets of learning, however. The results seem to be grouped together in two loose clusters. First, a number of the questions relate specifically to the study of religion (namely, questions about the students’ improved ability as regards “understanding religion from a variety of theoretical approaches,” “understanding of the diversity of religious beliefs in US culture,” and the like). These all demonstrate very dramatic self-reported improvements over the time. But relatively few interviewees report beginning with “very weak competency” in these capacities (an average of around 15% in these questions), while many more interviewees report ending with “very high competency” (an average of around 35%); this suggests they have a fairly positive assessment of their learning across time in these matters. Fully 80% exit the major with a 5 or 6 in “understanding of two or more religious traditions.” Other instructors are free to disagree, but this has not been my experience of teaching majors. A skeptic of my skepticism may suspect that I am holding the students to too high a standard, but in reply I would say, first, why is it important to you to dismiss my suspicion? and, second, do four out of five of your majors exhibit strong competency (or better) in understanding two or more religious traditions? Really? Even accounting for the fact that students prone to major in religious studies may well begin with more in the way of knowledge—and, we should not forget, often also more in the way of confidently held, though not infrequently empirically mistaken, beliefs—about the facts on the ground that are relevant to religious studies, again I wonder if it is perhaps not merely my innate misanthropy that makes me suspect that humans’ intrinsic proneness to self-congratulation (as well as the current generation of college students’ cheerful invulnerability to self-doubt) may be what is demonstrated here, at least as much as measurable learning. A second set of questions seek to measure more generic forms of learning. These questions, concerning “reflecting critically on one’s self,” “working effectively with individuals who are culturally different than you,” and “writing clearly and effectively” and “speaking clearly and effectively,” all seem to exhibit less dramatic improvement than the first set. But this seems to be not because the interviewees think they are less good at them at the end, in comparison with the field-specific questions; instead, it seems due to the fact that they think they were already not too bad as regards them, and thus had less room to improve. That is to say, the surveyed graduates report that upon retrospective reflection, they judge that they had generally good capacities for self-reflection, collaboration with peers, and self-expression of the spoken and written varieties. This seems again in some tension with my experience of my undergraduate students, at every stage, not only in their first year of college. Perhaps my students are especially problematic examples of American undergraduates. Many are the days that, for the fate of America and the planet as a whole, I hope that that is the case. But from what I have heard from my peers, that hope is not well founded. On the question of our graduates’ success in employment and career after the BA, it would help us to have something of a “standard” or norm whereby to measure outcomes. Lacking comparable data for other majors, it is hard to know what to make of the fact that students self-report as being employed in the general areas of, for instance, “business and finance” versus “marketing” versus “information systems and technology”. Is the fact that 10% of our students are employed in “education K–12 ” an outlier for other liberal arts majors? It is hard to tell. Still, even without that, there seem some plausibly significant findings. Roughly one-fifth of the interviewees end up employed in churches or religious organizations; one-seventh end up in higher education. That means that one-third of religion majors are employed in religion or higher education, or some combination of both. And of course it also means that two-thirds are employed elsewhere. What are they doing, and how do they use the skills they developed in their majors for their jobs? Furthermore, the survey suggests we should ask more questions about how graduates use their religion major in their everyday nonwork life. What does it mean to be informed in your existential questions by your education? Presumably our students have spent some time engaging with some range of the various ways that humans have been, and continue today to be, religious; what can they learn from these engagements that might be of use for their lives? I hope this is something that many of us care about, in religiously confessional ways as well as in nonconfessional ways. What might we say in this regard? More specifically in terms of employment matters, it is clear that our graduates face some difficulties when it comes to making connections between their majors and their employment paths. First of all, the graduates do not seem to believe their skills are marketable: Only a third of the students put their “research competencies” on their résumés, and just over 50% suggested that their “ability to interpret data critically” and “ability to analyze problems from different perspectives” were worth mentioning on their résumés. (Admittedly, fully two-thirds put their “communication competencies” on them—but those seem to me, perhaps incorrectly, less a distinctive contribution of religious studies.) Now, this may have to do with the sort of work that they’re doing, in two ways: first, they may assume that the positions are not research-focused; and that may simply be true. Second, however, and I suspect this is at least partially true, they may assume that their particular research competencies are not relevant. Here it seems we may be able to do a bit more work in helping our students gain confidence in research. This may be a matter of encouraging more assignments that involve research or more actively modeling research methods for them. While some of the texture of research in religious studies is idiosyncratic to the field, much of it is not; many of the skills a major in religious studies should develop should be applicable beyond the domain of our particular field. Teaching students to recognize the full value of these skills may require a small but significant change in the culture of our field. I recognize that we are uncomfortable “selling” ourselves, and inadvertently instrumentalizing a liberal arts education and sustained reflection upon religious expression and the life of faith by suggesting ways they will find it marketable. I share those worries. For the sake of our students’ futures, however, we must find some middle space between complete scholarly solipsism and over-eager materialist prostitution. Some more definite efforts on the part of religious studies faculty to help students understand the value of their learning for life outside the classroom may be indicated. This is not job training, but rather simply an effort to explain how the skills directly taught in religious studies courses are not “translatable,” but immediately applicable to a manifold of professional environments. One way to do this is to find clearer ways to make the connections between what we study in our scholarship and the real-world impact of that scholarship. We need not move out of the register of enrichment for enrichment’s sake; perhaps it is enough to complement that with some explicit attention to how empowering and useful are the skills with which we aim to equip students. More than half of respondents have pursued or are pursuing a graduate degree. Of these, the most common are MDivs or MAs (or PhDs) in religious studies, and JDs. Roughly 10% attempt but do not complete graduate programs both within and without religious studies. Again, it’s hard to know what these numbers mean without a comparison, but it does suggest something that my undergraduate major advisor told me when I asked her “what can one do for a career with a theology BA?” She replied: “this will not be your final degree. You can become professionalized in any number of directions with further academic credentialing. What those other, further degrees cannot do for you, and we can, is teach you to think.” I still think that remains perhaps the most useful advice we can give to our students—if, of course, we mean to back up our words with pedagogically effective deeds. The insights that I can glean from this data are very tentative, but several. First, we need to do a better job of being self-aware about what we are giving students—skills, knowledge, dispositions all matter, but we need to make sure we are able self-consciously to promote this. They cannot properly acquire what we offer if we do not realize fully what that is. Developing this awareness is not selling out our curricula or field, it’s making sure that we translate what we do into the language of the day. Second, we need also to be aware that students seem to not think they are in need of as much education as we think they are. Most of us would say that a crucial part of our intellectual repertoire is, to borrow from Donald Rumsfeld, the “known unknowns.” Judging from this survey, our students don’t seem nearly hungry enough for more knowledge. How can we teach them to know what they don’t yet know? How can we help them avoid becoming so self-satisfied that they stop at having some simulacra of critical thinking skills, and call it a day? Third—and only superficially in tension with the second—we must ask: how can we help the students see better that their achieved knowledge and skill set can actually be an immediate advantage to them, not just existentially but professionally, after they graduate? For me, formulating these questions makes this survey very much worth it. I hope we continue to produce such surveys, and continue to reflect on them as a scholarly association, in coming years. * Many thanks to Christina McRorie for help in organizing my thoughts in this piece. Charles Mathewes is the Carolyn M. Barbour Professor of Religious Studies at the University of Virginia.